Kosmas Pavlopoulos (KP) was born in Athens, Greece, in 1964. He received his B.Sc. in Geology and Ph.D. in Environmental Geomorphology from the University of Athens, Greece in 1986 and 1992, respectively. Since 2013, KP is Professor of environmental geomorphology in Geography and Planning Department at the University of Paris-Sorbonne Abu Dhabi. His previous appointments have been in Geography Department at the Harokopio University, Athens, Greece since 1999. He is chair of the working group on geoarcheology of IAG from 2009 to 2017 and member of the Scientific Council of the Athens French School since 2010. External reviewer as an expert in Geosciences, in Higher Education in ADEC (Abu Dhabi Education Council), for the authorization of new or existing higher education institutions and new academic programs. From 2017 is member of the EC of International Association of Geomorphologist as publications officer. Recognized specialist in the field of coastal geomorphology, sedimentology, Quaternary Paleo environments, seal level changes, and Quaternary climatic variability. 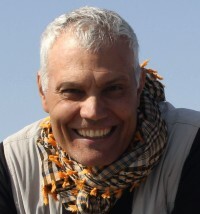 His research focuses on the sediments transportation and depositional environments on arid and semi-arid environments, geomorphological evolution of marginal landscapes, on the sea level changes, on the hydrogeology and the wadi dynamic, on water resources management and on natural hazards, in the Mediterranean and in the Middle East. He has participated in 54 research projects, in 15 of which as coordinator. He has more than 140 publications in peer-reviewed scientific journals (67 currently shown in Scopus) and his work received more than 630 citations (h-index = 16, co-authors 141, source Scopus) and 1109 citations (h-index = 30.56, source Research Gate). KP has been a supervisor in 11 PhD and as member of the supervising committee of 12 PhD students. He is member, as an expert in Geosciences and environment, for the evaluation of research projects launched by the Greek Ministry of Research since 2000, by the French institute of CNRS 2004-2007 (ECLIPSE program), by French ministry of Education and Research from 2012-2013 (ANR project), by the MIUR (the Italian Ministry for Education, University and Research) 2015-2016 (Reprise project) and by the Ford Motor Company in 2016 (Conservation and Environmental Grants).